What comes to mind when you think of Phoenix? Hot? Desert? If so, you’re not wrong, but you may not yet realize that those are two of the best reasons to make Phoenix your next adventure destination. The desert climate can mean triple digits in summer but from October to April it means perfect mild weather and sunshine to cure those winter blues! The desert offers so many different options for outdoor activities and the city of Phoenix provides easy access to explore the hiking and mountain biking trails nearby without ever going very far from town. The Phoenix metro area is home to smaller suburbs like Scottsdale, Mesa, and Tempe and all these towns have mountain preserves and trails encircling them. 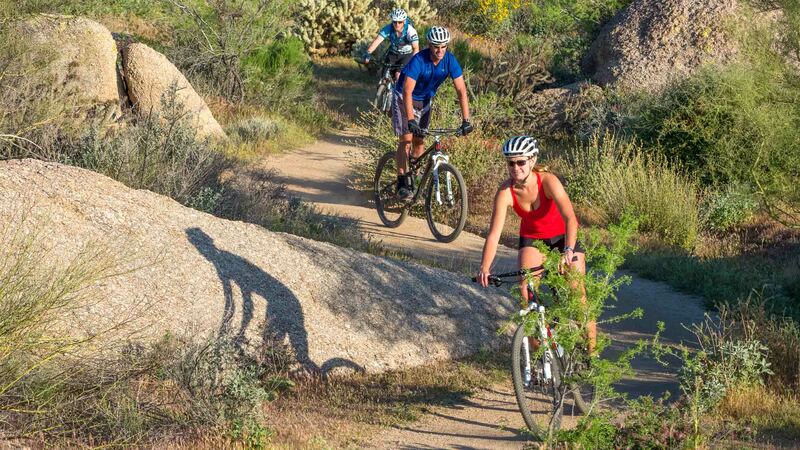 Enjoy mountain biking at Phoenix’s South Mountain Park, the largest municipal park in the country, or go for a hike at Scottsdale’s McDowell Sonoran Preserve, a desert reserve so large it’s more than ¼ of the city’s entire land mass! AOA’s headquarters in the Phoenix metro area allow us to facilitate a wide range of custom tours for groups large and small. We have experience with desert camping adventures, teambuilding and corporate events, and partnering with organizations to provide operational support for their adventure programs.